Today we welcome Meg of write meg! Please give her a warm welcome! While I’ve always been a reader, I didn’t begin reviewing books until 2008. I studied English Literature in college, worked as a bookseller for many years and greatly missed my time spent chatting books after I accepted a full-time newspaper gig post-graduation. Looking for a way to continuing sharing novels with others, I discovered book blogs by Googling for thoughts on a recent story -- and wow. I missed talking books, and realized these folks talk about books all the time. A match made in heaven? Indeed. Though my tastes have shifted over the years, I primarily read and review women’s fiction, contemporary fiction, literary fiction and young adult stories. Once skeptical of non-fiction (too boring! ), I’ve been converted -- and now love memoirs, especially when they center on love, family and growth. write meg! arrives from Maryland in the U.S., where I was born and raised. My hometown is about 30 minutes outside Washington, D.C., so I spend quite a bit of time in the city. During the daylight hours, I work as a newspaper columnist and editor for three papers in the suburbs -- and I really love my job. I get paid to write and surround myself with words . . . does it get any better? If you’d like to track me down, I’m all over the place. A few links . . .
Hope to see you! And bring cake! Thank you for joining us today, Meg! Remember to check out Meg's blog, write meg!, and leave a comment or question below. POSTCARD BLOGGING EXCHANGE: Show Us Your Local Library! 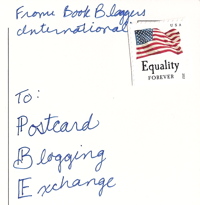 We would like to tell you about a new idea we had called Postcard Blogging Exchange! We want to invite all of our readers to participate in a “postcard” exchange of sorts by creating a theme and asking you to contribute your own post. It works like this: On the last Friday of each month we will put up a post like this one giving you the theme. For example this time we are asking for a photo of your local library. UNC-Greensboro's Library, where Becca worked and studied during college. 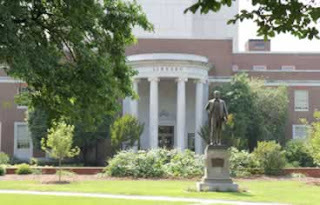 The nine-story grey building behind it is also the library. Then we will add a Link-Up to the bottom of the post so that you all can take part. First, grab the awesome Postcard Blogging Exchange image that Tasha made above, then take a photo of your local library, or even better YOU at your local library, and make a post about it on your own blog. Link that post up here so everyone can come check it out. Then be sure to check out the other links, too! We can’t wait to see your local libraries where you find books that you read and share with us on your blogs! How cool is that?!? So, link up below and, above all, have fun! 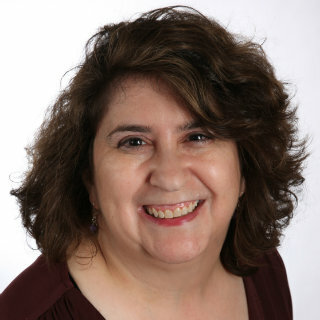 Please welcome Florinda, who blogs at The 3 R's Blog: Reading, 'Riting, and Randomness. The first book I remember reading over and over was Little Women, but I'm not sure it actually was the first book I did that with. My (non-prescription, magnifying) reading glasses, because I've now reached an age where I literally cannot read without them! Ulysses, and/or anything else by James Joyce. Also, anything by William Faulkner. Almost any novel with overly complex language, really--I lack the patience and am not fond of getting headaches. I blog about a lot of things--maybe too many things!--that aren't directly about books, but often about the blogging/online life. Eclectic Reader! "You read for entertainment but also to expand your mind. You're open to new ideas and new writers, and are not wedded to a particular genre or limited range of authors." Thank you for joining us today, Florinda! Remember to check out Florinda's blog, The 3 R's Blog: Reading, 'Riting, and Randomness, and leave a comment or question below! So, in my last post I wrote about why we should bother commenting on others blogs. In the comments section (where you took my advice, yay!) you told me that often you don't comment because you don't know what to say or someone already said what you were thinking. You told me that if you didn't have anything meaningful to say or a way to contribute to the discussion, you don't comment, even if you loved reading the post. That really got my mental juices churning (can you hear the hamster on its wheel?). I, along with Lisa of Lisa's World of Books and Tanya Patrice of Girlxoxo.com, are heading up the commenting committee this year for Armchair BEA, which Tif told you about last week. One of the new ideas we had was to put together a Cheerleader Starter Packet for Commenting Committee volunteers for the event. One of the items we included were different ways to comment when you have no idea what to say. I want to share some of what we came up with with you today. "This book sounds like something I would enjoy reading. Thank you for bringing it to my attention!" "I haven't read this book yet, but I am hoping to get to it soon!" "I wasn't interested in this book before, but your review has changed my mind about it!" Obviously, the more meaningful and personalized the comment, the better. But we are all only human and sometimes we can't always think of those witty or essential comments to add. Now that you have the power of commenting in your hands, be sure to sign up for the Armchair BEA Commenting Committee! It comes with awesome graphics I designed AND you can win prizes! Start showing off your new commenting prowess by leaving one for us here! Please welcome Jen, aka DevourerofBooks, to the blog! Jen is responsible for a great deal of books in my (Becca) TBR pile. Today Jen answers some questions about her blog and her reading habits. I remember being 4 or 5 and marching into where all the adults were sitting at a table. I had a book in my hand and proudly announced that I had just read it on my own. I just wish I still knew what that book was. Probably John Steinbeck's East of Eden, I used to read that yearly at most. It may be about time for a re-read. It is more of a mountain, really. Sadly by the time I have had a book for 6 months or so and not gotten to it, the chances of it ever being read begins to approach zero as it gets buried by all sorts of new stuff. Infinite Jest, both the length and just David Foster Wallace intimidates me. I do LOTS of projects. I have Audiobook Week every summer during June is Audiobook Month, I have a podcast that is currently on hiatus, I do an online book club periodically, and of course the newly launched Bloggers Recommend (www.bloggers-recommend.com), which aggregates blogger recommendations to create a monthly best-of list. I'm not sure that this quiz is valid because there was a question that assumed it was possible for me to finish "last" book. The last one on that particular shelf, maybe, but last unread book in the house? That's a whole zombie apocalypse away. Anyway, I'm an "All-Rounder," I fit equally into all four categories: involved, exacting, serial, eclectic. Thank you for joining us today, Jen! Remember to check out Jen's blogs, Devourer of Books, and Book Bloggers Recommend, and to leave a comment or question below! 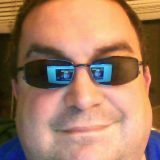 Please welcome Chris, who blogs at Chrisbookarama. January 2007, I'm an old timer. Literary fiction, classic lit, a little bit of everything else. That has to be Jane Eyre. I love that book so much that I've read it several times over the years. I always get something new out of it. I don't care that I know how it ends, I love the journey. getting out of hand. I bought 2 great big ones and I was determined to keep them neat but as I bought more books, I ran out of room. Now I have a bunch piled up in front of the places they should be shelved. still growing. Does it ever stop? It's 1000 times worse since I started book blogging. Almost everyday I read about another book I want to read from other book bloggers. Bunch of enablers. Hm, this is tough because I usually like just about everything, but one that I hated with the fiery passion of a thousand suns was The Wolf Gift by Anne Rice. Lots of people liked it but I didn't. She had an obsession with salads. And it was boring. The UK. I would love to visit Bronte country and all the spots mentioned in the Austen books. I bet there are tours catering to book nerds like me. Depends. When I'm edgy and anxious and punchy, I grab my sneakers and run. It helps. When I just want to veg in front of the TV, I pick a crochet project and work on that. The Painted Veil by W Somerset Maugham. I saw the movie first and actually prefer it to the book. Maugham's ending is sort of cynical. I suppose the movie is less realistic but much more romantic. Edward Norton and Naomi Watts are so good in it too. I write it! Haha! Okay, maybe not. I don't tend to review the latest books and I look for books that are a little bit different. If you don't care for one genre I've reviewed, just wait I'll review something different the next time. I'm like the weather that way. Eclectic Reader! You read for entertainment but also to expand your mind. You're open to new ideas and new writers, and are not wedded to a particular genre or limited range of authors. This does not surprise me in the least. I tend to flit from one genre to the next. I like to try a bit of everything. I have my favorites, but love to read something that's different as long as it's well written. Thanks for having me on the Book Bloggers International Blog! Thank you for joining us today, Chris! Remember to check out Chris' blog, Chrisbookarama, and leave a comment or question below. Armchair BEA: All You Need to Know! Today I am here at Book Bloggers International wearing two hats: one as a co-author for this very site and one as a co-founder of Armchair BEA! I am excited to share with you just a few details about the latter, one of the largest book blogger events around! Armchair BEA is an online event that is currently celebrating its fourth year! It runs simultaneously and in partnership with Book Expo America, one of the largest book-ish events in the world! Throughout the week, the Armchair BEA team brings you daily discussion topics, an opportunity to interact and network with other book bloggers, authors, and publishers, views of the big event itself, and lots and lots of giveaways! For more information, you can also check out the NEW FAQ page! Mark your calendars for Monday, May 27 – Sunday, June 2! The official schedule will be published very soon! Who is the Armchair BEA team? Armchair BEA is a HUGE event, so our team continues to grow every year. Let me introduce you to the 2013 team . . .
Where do I find Armchair BEA? Last year, we had more than 600 participants! It is a great opportunity to not only get some great information on what is hot and what is coming in the book world, but it provides you a great network of other book bloggers from all around the world. From the daily discussions to the giveaway loot and lively twitter chats, there is something available for everyone! And, you choose your level of participation! You can get involved in a variety of ways! Let me list the ways . . . Registration: Registration opened earlier this week, so click on over and get registered for the event! Grab one of our buttons, help us spread the word, then prepare to participate as little or as much as you would like during the week! Twitter Parties: The twitter parties are always some of our biggest events! We talk about all things literary multiple times throughout the week. Specific dates and times will be announced in the near future! Armchair BEA is quickly approaching! Will you be joining us? Do you have any questions? Comment and let me know. You are also welcome to contact me directly at tiftalksbooks (at) gmail (dot) com or the Armchair team at armchairbea (at) gmail (dot) com. Please welcome Alex, who blogs at A Girl Books and Other Things. Alex's blog is known for YA and romance novel reviews. GENRES COVERED MOST ON MY BLOG: Romance Novels and YA, I read more subgenres, some more than others, but mostly go back between contemporary and historical fiction. MY EARLIEST MEMORY OF READING: Well, I learned to read when I was 4 and I remember this book with a purple elephant on he cover that for some reason I found. FIRST BOOK I READ OVER AND OVER: Little Women by Louisa May Alcott. Though before I discovered online shopping I re-read all the books I got my paws on at least four times. MY FAVORITE PLACE TO READ: The bus oddly enough, because I don't feel like I should be doing something else. MY MUST-HAVE READING ACCESSORIES:Just my book mark and sometimes post it notes when I want to take notes. MY BOOKSHELVES ARE: Over-crowded - one of my bookcases went caput two weeks ago so now everything is a little cramped. MY TBR LIST/PILE IS: Large.. not counting review stuff, or e-stuff, I got at least twenty dead-tree books that need to be read, some have been hanging out for two or three years. A BOOK THAT HAS CHANGED MY LIFE IN SOME WAY: That's a really tough question, I guess that the Princess Diaries opened me up to the whole world of YA, and Lisa Kleyas did the same for romance, but I would probably have to say Melina Marchetta's stuff because of the way she portrays families and friendships that aren't perfect but yet are awesome. Also, Second Start to the Right by Debra Hautzig. A BOOK I LIKE THAT NO ONE ELSE SEEMS TO: Wow, totes blanking out just now... Okay, I think I'm going to go with Just Like Heaven by Julia Quinn, not because people don't like it but because I haven't found anyone who has loved that book as much as I did - it was one of my favorite reas of 2011 but everyone else thought it was just Ok.
A BOOK I DON’T LIKE THAT EVERYONE ELSE SEEMS TO LOVE: Where do I start? Aside from Twilight? well... there is Code Name Verity (I can see it's value, I just didn't like it), Loretta Chase's stuff, I just don't click with it. Two-Way Street by Lauren Brandholt (which I kind of hate with passion). Elizabeth Scott's stuff too, I always hear great things about it, haven't read a book by her that I've liked. A BOOK THAT INTIMIDATES ME: The Tea Rose by Jennifer Connelly. I've had it for YEARS but is SO LONG and the font so tiny that I just can't. MY FAVORITE NON-BOOKISH ACTIVITY: Watching Movies and obsessing about TV. I'm a big animation aficionado so I watch a lot of that. Also, baking! MY FAVORITE BOOK TO MOVIE ADAPTATION: BBC's Sense and Sensibility, Pride and Prejudice and The Buccaneers (Edith Warton), The french animated version of the Last Unicorn, Howl's Moving Castle (LOVE THE MOVIE!! don't care much for the book). And a Walk to Remember. Oh and the LIttle Princess and The Secret Garden!! MY BOOK BLOG STANDS OUT FROM THE CROWD BECAUSE: I want to think that because I try to give both Romance and YA the same amount of space and because I like to write about other stuff too. MY MUST-READ BLOGS: Small Review (her reviews and opinion posts are hilarious), Between the Pages (Because Daisy and I have similar tastes but they are different enough that she nudges me in the direction of books that I maybe hadn't considered before). MY READING PERSONALITY (via quiz at http://www.bookbrowse.com/quiz/): Eclectic. Which is weird to me because I tend to stay within my comfort zone but there you go! Thank you for joining us today, Alex! Remember to check out Alex's blog, A Girl Books and Other Things, and leave a comment or question. Please welcome Colette, who blogs at A Buckeye Girl Reads. Colette's blog is known for romance reviews. THE BOOK I HAVE RE-READ THE MOST TIMES: It's a tie between The Gift By Julie Garwood, Till Dawn Tames The Night by Megan McKinney, and Outlander by Diana Gabaldon. MY BOOKSHELVES ARE: A hot mess! A BOOK THAT HAS CHANGED MY LIFE IN SOME WAY: Touched By An Alien by Gini Koch. I picked it by chance, loved it & devoured the whole series. It led me to be Gini's assistant, which I love doing! IF I COULD GO TO ANY LITERARY DESTINATION I WOULD CHOOSE: Hogwarts! MY LEAST FAVORITE BOOK TO MOVIE ADAPTATION: P.S. I Love You-I watched the movie as part of a reading challenge, and they changed the main characters nationality to an American! Thank you for joining us today, Colette! Remember to check out Colette's blog, A Buckeye Girl Reads, and leave a comment or question. According to several sources, search results with the author's photo attached are clicked on anywhere between 15-20 percent more than unauthored results. Another benefit to Google Authorship is that with it, Google recognizes you as the owner of your content. That makes it harder for people to plagiarize from your site. Sounds great, right? There's just one tiny downside--setting up Google Authorship is a bit of a PROCESS. Read: pain in the buttocks. Now, there are tons of directions on how to do this. I recommend looking at this flow chart, which has the most cogent explanation of setting up Google Authorship I've come across so far, although the links aren't live and several of the URLs are dead. But the bigger point is, see how long that flow chart is? YEAH. Say goodbye to your afternoon. You need to set up a Google + profile with links to your blogs and a picture and the whole deal. Google REALLY wants you on G+. Once that's done, if you have an e-mail address with the same domain as the site you write for (e.g., smithymcsmithson@wired.com), all you have to do is register your e-mail addy with Google. Done! For the rest of us mere mortals, UHG. No. You have to get a code and embed it on the homepage of your blog. And possibly every post on said blog, I'm still not clear on that. But definitely the homepage. You can view the code on Higher Visibility. Think you're done? Not really. Now you have to test to make sure everything's working on the Rich Snippets Testing Tool. Then wait a few weeks and hopefully your picture will show up. If not, you must pray to the Google Help Forum gods for guidance. Oh, this is just for Blogger sites, by the way. If you have a blog on another platform like WordPress it's completely different. So, as you can see, Google Authorship is a bit of a time and sanity investment. But I think it is worth it in the end. Have questions or tips about Google Authorship? Feel free to ask in the comments! Please welcome Bridget, who blogs at Portable Pieces of Thoughts. Bridget's blog is known for great essays and eclectic, creative reviews. MY EARLIEST MEMORY OF READING: ??? FIRST BOOK I READ OVER AND OVER: LOTR by Tolkien. I couldn't get enough of it. And then I discovered Silmarillion ;). MY FAVORITE PLACE TO READ: where nobody can disturb me. MY BOOKSHELVES ARE: I don't believe in shelves. I believe in glass bookcases. MY TBR LIST/PILE IS: too full? too long? A BOOK THAT INTIMIDATES ME: there is no such a book. MY BOOK BLOG STANDS OUT FROM THE CROWD BECAUSE: it doesn't stand out from the crowd. Not really. No fireworsks just reviews and essays. MY READING PERSONALITY (http://www.bookbrowse.com/quiz/) IS: OK I actually went there and did that quiz. Here is the result: "You read for entertainment but also to expand your mind. You're open to new ideas and new writers, and are not wedded to a particular genre or limited range of authors." I quite agree. Thank you for joining us today, Bridget! 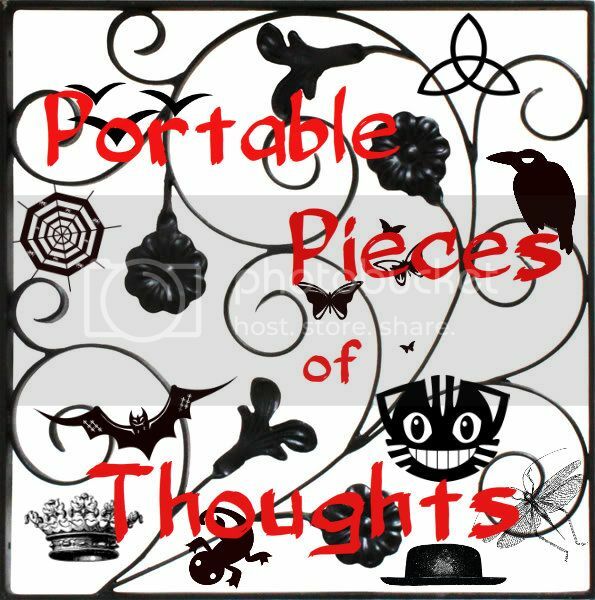 Remember to check out Bridget's blog, Portable Pieces of Thoughts, and leave a comment or question. 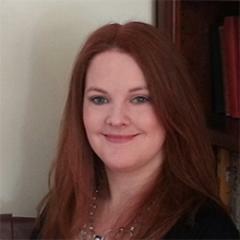 Please welcome Kelly, who blogs at The Well-Read Redhead. 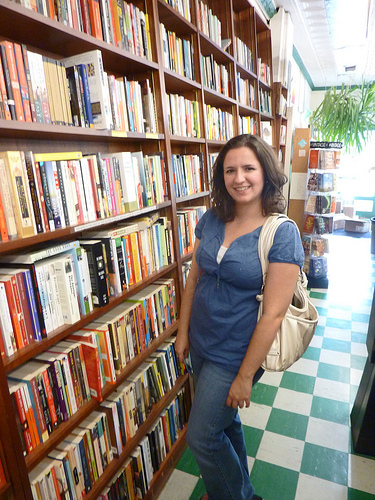 Today Kelly is answering 15 questions about her blog and her reading habits. Welcome, Kelly! A LITTLE ABOUT ME (I added this question, hope that's OK! ): I'm a 20...(okay, almost 30)-something voracious reader, living and working in upstate New York. I'm a part-time employee at a university, a part-time stay-at-home mom, and a full time book lover. When I'm not reading or blogging, I'm usually keeping my toddler out of the toilet, watching reruns of Diners, Drive Ins, and Dives with my husband, and trying to get my dog to stop chasing the neighborhood cats. Which all sounds rather hectic, but I love every second. GENRES COVERED MOST ON MY BLOG: I love contemporary fiction in general, but I do pay particular attention to women's fiction. I also dabble in YA, historical fiction, nonfiction (especially bios and food-related memoirs), mystery/thriller, and literary fiction. FIRST BOOK I READ OVER AND OVER: Probably lots of kid books (Goodnight Moon, anyone?) but the first chapter book was definitelyMatilda by Roald Dahl. What 10-year-old girl DOESN'T want to push people around with her eyes? MY FAVORITE PLACE TO READ: Number one is the beach. Number two is the pedicurist's chair. But I don't get to go to either of those places as often as I'd like, so more realistically, it's my big ol' comfy brown couch in our living room while wearing my Snuggie and drinking wine. YES. MY BOOKSHELVES ARE: FULL. I am always trying to give books away and make room for new ones, because I hate clutter and I'm determined not to have more books than I can fit on the shelves. (I know, not normal for a voracious reader...but organized-me and reader-me had to find a middle ground.) It doesn't help that my 1-year-old son's book collection is growing quickly, so he's taking over some of my shelf space! The things we do for our kids. MY TBR LIST/PILE IS: Total insanity. I have 784 books on my Goodreads TBR list. And I swear I would read all of them, if given the ten lifetimes it would require. A BOOK I LIKE THAT NO ONE ELSE SEEMS TO: I don't think people necessarily dislike it, but What Dreams May Come by Richard Matheson is on my favorites list, and I don't think many others rate it that high. It's a very emotional book for me, and I'm stingy with my tears, so anything that makes me cry gets considered for the favorites list. A BOOK I DON'T LIKE THAT EVERYONE ELSE SEEMS TO LOVE: 50 Shades of Grey. Don't even get me started. A close second:Twilight. IF I COULD GO TO ANY LITERARY DESTINATION I WOULD CHOOSE: Does the destination have to be fictional? If so, Hogwarts. DUH. But if we're considering real places too, The Girl With The Dragon Tattoo books made me want to go to Sweden SO BAD. MY FAVORITE NON-BOOKISH ACTIVITY: Primarily, spending time with my son and husband. Mommy and Wifey are my favorite job titles. Beyond that, I love traveling, running, scrapbooking, hiking, and snowboarding. MY FAVORITE BOOK TO MOVIE ADAPTATION: There are so many good ones, but I think Martin Scorcese totally nailed Dennis Lehane'sShutter Island. Especially the ending. SO AWESOME. MY BOOK BLOG STANDS OUT FROM THE CROWD BECAUSE: I spend a crazy amount of time perfecting my book reviews. I've heard some other bloggers say that they don't do loads of review posts because they get the lowest number of page views, but I haven't found that to be true. And even if it was, the whole reason I started this blog was so I could share my reviews...other bookish musings are fun (and I love reading some of the blogs that specialize in that), but they are secondary for me. So I really try to craft my reviews well. I always want them to be a combination of informative, critical, and funny...with maybe some ridiculous Mean Girls gifs thrown in for good measure. MY MUST-READ BLOGS: I can only pick THREE? Oh man. Okay, I'll go with Words for Worms, The Relentless Reader, and Girlxoxo. They are, all three, amazeballs. Kelly can also be found on Twitter @TheWRRedhead, and Goodreads. Thank you for joining us today, Kelly! Remember to check out Kelly's blog, The Well-Read Redhead, and leave a comment or question below! 1. Give comments to get comments. Commenting on other book blogs is vital to increasing commenting and readership on your own blog. When you leave a comment on another blog, you are firstly, showing you appreciate the content on the post or blog; secondly, want to build a relationship with the blogger; and thirdly, you are leaving a link back to your blog. The author of the blog can use this link to return the favor on your blog. Not to mention any other commenters from the post who will also see your comment and perhaps decide to visit as well. Now if you truly want to make an impression, you can’t just leave one half-hearted comment and never return. If someone did that on your blog, would you feel very inclined to go visit and make yourself a loyal follower/commenter of their blog? You give what you get. So if you give a half-hearted comment, don’t expect more in return. If you give a clever, understanding, or opinionated comment, and especially if you make return visits, the blogger will remember you and be more likely to seek you out. Now you aren’t going to notice some huge traffic spike all at once, but by leaving your “calling card” through commenters all over the blogosphere, you are sure to notice a gradual increase as time goes on. If people don’t know about you, they can’t invest themselves into your blog. It’s like a new car company creating a car and then not advertising it on television and radio. Who’s going to use it if they don’t know of its existence? Then the ad (comment) is your chance to show off why someone should try your car (blog) out. Not many cars are sold without test drives, and you cannot get people to test drive it if no one shows up because they didn’t know you were there. Now commenting is just the beginning. If you truly want your readers to be engaged on your blog, you need to do more than just advertise and network. A businessman/woman doesn’t attend a networking conference and just hand out his business card, make a few comments, and then set off to the next target. A truly savvy businessman knows that engaging others in a meaningful conversation is the best way to become memorable. If you think just adding someone on Twitter or Facebook is going to be all you need to do in terms of networking, you are missing the point. People aren't going to click on your links just because you tell them to. Give them a reason to. Make them want to find out what you are writing about and reviewing. Engage them in conversations. Just like you, other bloggers just want to be heard. We all want to know someone is not just hearing us, but truly listening to what we have to say. When you engage others in a back-and-forth discussion you are creating not only new readers, but you will probably forge new friendships, as well. Not only will your blog benefit from commenting on others’ blogs, but you will also discover new blogs. I love discovering new blogs because it is always a chance to find another person who you can become friends with, another blogger who gets the same books you do. You will discover new books on their blogs and you will find those whose tastes align with your own. You will learn how close to what they think about a book correlates to your own tastes and opinions. So you can see that commenting is an integral part in building your own blog up and to making a name for yourself in the book blogging world. Please welcome our first guest blogger on BBI, Bryan, who blogs at Still Unfinished. You might also recognize Bryan as one of the moderators of the Book Bloggers Discussion Group. Welcome, Bryan! I am a book blogger. I am not a book blogger. OK, OK, I AM! Okay already, I, Bryan G. Robinson of the blog Still Unfinished, AM a book blogger! I am NOT ONLY a book blogger, but I am still a book blogger. It wasn't always that way. When I began blogging in October 2005, I was chronicling my journey toward a marathon by the time I was 40. I was 37 at the time and I completed a 25 mile trail hike in 2007. Over the next few years, I had a number of blogs, ranging in subjects from running to books to spirituality to humor, including one with all four subjects. Last year, I started the blog, Still Unfinished, the name being a take-off from the name of my previous blog, an unfinished person (in this unfinished universe), with the first part of the title being the online persona I went by, Unfinished Person. That title and moniker came from a quote by George Sheehan: " 'We live in an open universe,' said William James, 'in which uncertainty, choice, hypothesis, novelties and possibilities are natural.' But if the universe is unfinished, so are we. Each one of us is, in fact, an open universe. Each one of us is a microcosm of uncertainty, choice, hypothesis, novelties and possibilities. Each one of us is an unfinished person in this unfinished universe. And each one of us feels an infinite and mysterious obligation to complete ourselves and somehow contribute to the completion of the universe." and since my life is still incomplete, I decided to keep the name. When I do blog about books, I mostly blog about crime fiction or mysteries, but veer into YA and other genres from time to time. On that previous blog, I kept track of my physical, mental and spiritual life, which included books. My blog is now at Still Unfinished, since my life is still incomplete. There, I primarily keep track of what I'm reading, what I'm watching, what I'm listening to, and what I'm photographing. On my Facebook profile, which is public, I chronicle my personal life; on my Google Plus profile, my reading life; and on Twitter and on listography, my reading and movie-watching life. Oh, since this is for Book Bloggers International, I guess I should mention from where I'm blogging: Pennsyltucky, i.e. northern Pennsylvania in the U.S. of A. We're not all backwards here, we just walk and talk that way. That's why we believe in backward masking. Thank you for joining us today, Bryan ! Remember to check out Bryan's blog, Still Unfinished, and leave a comment or question. So, what is Book Bloggers International exactly anyway? There are SO, so, so many book bloggers all over the world and it is impossible for each of us to find each other via links on other people's blogs and social networking sites alone. We thought it would be a practical and fun idea to create a blog specifically for the purpose of introducing ourselves to one another and finding new book blogs to love and book blogging buddies to love, too! Bloggers will have the option of answering a questionnaire or writing a short (roughly 300 to 400-word) introductory guest post where you will talk about your blog. Things to include: how long you've been blogging, where you're blogging from, how you got started blogging, how you picked your blog name, genres you review, and fun features on your blog. Then you can also include lots of your own fun stuff, for example how likely your TBR pile is to tumble over, what your earliest memory of reading is, your favorite place to read, or the literary destination you’ve always dreamed about going. You get the idea! You can include links to other blogs you write (if you have more) and to all of your social networking sites, too. Example, Lost in Books might be tagged as U.S. Blogs, Literary Fiction, Historical Fiction, World Cultures, Paranormal. You get the point. That way you can look up blogs by tags/labels to find ones that fit your interests the most. Of course, I will always be a proponent of exploring so be sure to check out some blogs that you wouldn't necessarily pick to look at right away, but that you might end up loving just the same! It will, of course, take a while for us to gather up a good database and if you ever think your blog needs a label added or a label seems not appropriate for your blog, don't hesitate to let us know and we will change it for you. This is a blog for all of us- the whole book blogging community. If you want to participate by writing a guest post about your book blog and blogging life, then please e-mail us at bookbloggersintl (at) gmail (dot) com with the subject heading of "BBI: Guest Post".